Convenience store clerk is not a particularly lucrative or glamorous job. It’s still a front-line customer service position, though, which means it’s a position that Japanese companies take very seriously. Why? Because FamilyMart thinks the “Please come again” part is difficult for its increasing number of foreign employees to remember. That might sound like an offensively dim view of the communication capabilities of Japan’s foreign residents, but the linguistics behind the previously required phrase are actually pretty complex. In Japanese, the standard way to say “Please come again” is Mata kite kudasai, but that’s nowhere near what FamilyMart employees were required to say. 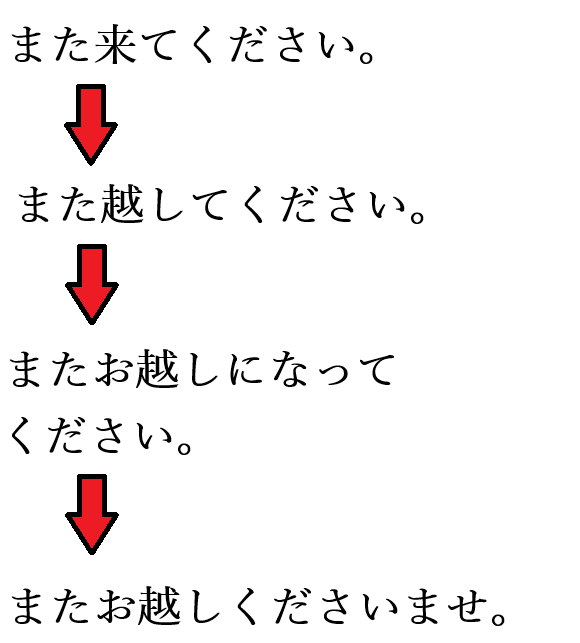 ▼ Changing mata kite kudasai to mata koshite kudasai, and then changing that to Mata okoshi ni natte kudasai. Except even that’s not the correct phrase for interacting with customers. Kudasaimay mean “please,” but for respectful speech, it should be changed to the more polished kudasaimase. And then there’s one more step to the process, dropping the ni natte, since okoshi can also function grammatically as a noun, finally giving us Mata okoshi kudasaimase, the phrase meaning “Please come again” that FamilyMart clerks were previously required to say. ▼ The compete transformation from mata kite kudasai to mata okoshite kudasaimase. So with a growing number of employees who aren’t native speakers of Japanese, FamilyMart has decided it’s simpler to just have its clerks say just Arigato gozaimasu (“Thank you very much”) instead of Arigato gozaimasu. Mata okoshi kudasaimase (“Thank you very much, and please come again.”). The chain’s policy was quietly changed in March, along with the abolishment of a rule that prohibited employees with naturally black hair from dying it. In consideration of youth trends, FamilyMart now allows clerks to have dyed blond or brown hair, though wilder hues are still prohibited. The company has also not relaxed its rule prohibiting clerks from wearing earrings or necklaces while working, citing hygiene concerns (convenience store clerks do double as food prep workers, after all, cooking and serving up fried chicken, croquettes, and other items prepared in-store). In the three months since the new rules went into effect, FamilyMart says it has yet to receive a single complaint regarding the dropping of “Please come again” or brown/blond-haired clerks, suggesting that the relaxed policies are here to stay. Stupid and petty. It is not that hard to say ''Mata okoshite kudasaimase.' Hear it once in training, hear it once in store, and then it is fine. I, for one, will boycott family Mart until they stop acting so arrogant, and frankly, stupid. "But that’s not all. 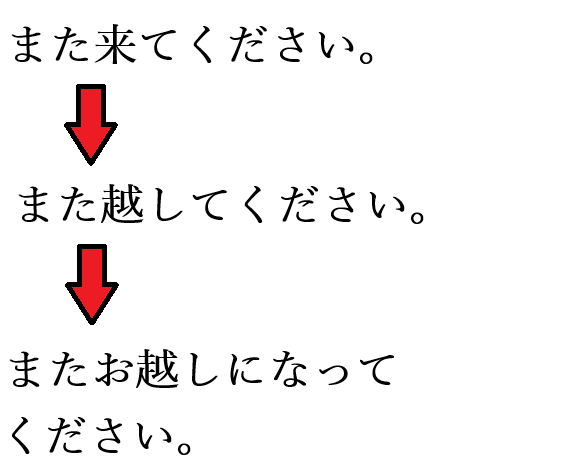 Japanese has a systematic form of grammar used for respectful speech, which requires adding an o- to the beginning of a verb, lopping off its last syllable, changing that removed syllable to its corresponding stem ending (for which there are multiple methods depending on the base form of the verb), then adding the preposition ni and the appropriate form of the verb naru (usually “become,” but meaning “do” for this purpose) onto the end. So koshite would be no good. It’d have to be changed to okoshi ni natte, which would now give us “Mata okoshi ni natte kudasai.”So with a growing number of employees who aren’t native speakers of Japanese, FamilyMart has decided it’s simpler to just have its clerks say just Arigato gozaimasu (“Thank you very much”) instead of Arigato gozaimasu. Mata okoshi kudasaimase (“Thank you very much, and please come again.”)." I can see when that might become confusing. Once you start getting use to one saying, you might slip every now and then. I notice in many convenience stores that they do not say thank you to my face but wait until I have paid and am departing. A form of rebellion. The worst customer service that I ever recall was at a bestbuy in the bay area and I just bought a 300 dollar tv and the smug a-hole white male clerk just said "have a nice day." and I said "you don't say thank you?". I will never ever go to that place again and will relish their bankruptcy. Idiotic. anyway mouthing meaningless phrases is not exactly crucial to "customer service". This is one aspect of the language that I have always disliked. Forcing overly formal speech to me comes across as overly robotic, utterly lacking in any real warm & in fact comes across cold & sterile MOST of the time. Some simple language & a SMILE however does the trick! 20 years in Japan, never heard a family mart employee say please come again. What's the Japanese equivalent for "Y'all come back now, y'hear?" Taking this to its logical absurdity, does this mean I can complain if anyone in any store I visit makes a comment to me as a customer that is lower on the politeness scale than "Mata okoshi kudasaimase"? I'm sure it must happen quite often. It's not always appropriate to extrapolate, but I get the feeling this story reflects an underlying attitude that sees gaijin, here as staff, first and foremost as problems waiting to happen. Like it or not, foreign workers are now part of the the Japanese economy, and such negative thinking is not how Japan started making extremely complex things like cars, motorcycles, electronics, and machine tools that have enriched the country. Such goods emerged from a culture of "can do", not a culture of fear. Such goods emerged from a culture of "can do", not a culture of fear. Sadly, those days are long gone. It's fear all the way now. I’ve got no problem with FM changing their policy but this article is ridiculously over-thought. The workers didn’t need to go through this process of changing the phrase though multiple versions or understanding all the grammar/politeness points. They simply needed to memorize the three-word phrase as taught to them by the company. This is actually really stupid. While understanding the grammatical nuances behind the phrase might be difficult, the actual phrase itself is extremely short and easy to memorize. Probably within the fist half hour on the job even people with next to no Japanese skills can have it memorized. As long as Family Mart can get people to stand behind a cash register for hours at time then it’s all good! Many customers I see in convenience stores, who grunt single syllable commands at the staff, do not deserve to get any form of polite response. Staff working from a script, reciting trite lines by rote, is not good customer service. In many shops and businesses it often throws staff when a customer doesn't follow the script - they don't know what to say. Just let both staff and customers display basic civilities, that should be enough. It's a rather patronising approach from Family Mart. Never heard any Family Mart employee say that to me or anyone else waiting in line. Using the foreigners as a scapegoat for a policy change. Will Family Mart be training their workers on something useful like cutting down on the pointless use of plastic bags? Or is that too hard for the foreigners to understand as well? I don't think I heard that phrase in the 11 years I lived in Japan. Certainly not from Family Mart clerks, and I lived near a national university that was staffed with plenty of students who went on to become doctors. Must be too hard for doctors to understand. I like going to shops where NJ are employed, because they always roll their eyes in embarrassment when they have to do this schtik at the end of the transaction. The Japanese employees do it with dead seriousness. Says something about the sense of self, doesn't it - the Japanese pt workers are still locked in the mindset of feudal serfs, while the NJ are self-aware. Nobody is going to come again because their clerk who rang them up said so. Sidebar: why allow blonde, but not red? Red is a natural hair colour too. To each their own, I personally just prefer an employee that pays attention. A fake smile means as little to me as their "robotic" words. I don't smile back anyway as, why? Most Norwegian store clerks have normal facial expression, unlike I know American ones who always have those huge fake white glaring teeth in my eyes. A simple thank you is all that's necessary. the smug a-hole white male clerk just said "have a nice day." and I said "you don't say thank you?". I will never ever go to that place again and will relish their bankruptcy. The nerve of that cretin to wish you had a nice day! What's the world coming to?